After living 13 years underground, cicadas are making their way through the south and Midwest, causing quite a ruckus. These insects spend most of their lives underground, nourishing themselves on roots. But then, every 13 years, they crawl to the surface, buzz around, mate, lay eggs and die - all in a matter of six weeks. On "The Early Show" CBS News Correspondent Betty Nguyen shared a report about a little boy who finds periodical cicadas - including their song that some find annoying - quite fascinating. 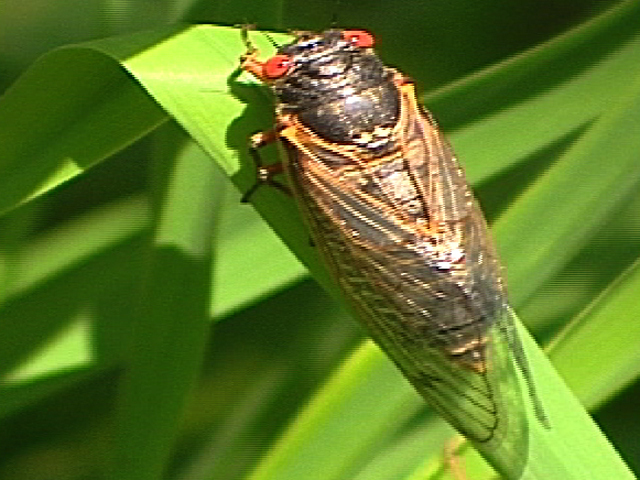 Nine-year-old Lucas Phillips wasn't even born the last time these cicadas invaded the South. But he's been waiting for them to surface. He told Nguyen the bugs' return is "a whole lot better than Disneyland." When Nguyen said, "No way," Lucas replied, "Even though I never been to Disneyland, I bet it's better." Click on the video below for the full report - and see "The Early Show" anchors' reactions to some insect visitors at our New York studio. The cicadas seen on "The Early Show" were provided by Dr. Elias Bonaros.